A Showcase Stair in a luxury apartment is located in 1) a lobby, as a grand stair that represents an apartment’s style, and/or 2) a private unit as a sculptural and/or dematerialized stair. Showcase stairs in historic and contemporary luxury apartments are also grand in size, scale, materials and visual access. Located in public lobbies, their function is less about circulation than they are about visual access and making a strong architectural statement. 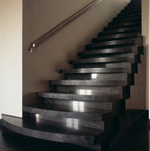 Similarly a dramatic or sculptural stair can transform simple box-shaped spaces into one with architectural character. There are two types of stairs in luxury apartments—a grand staircase located in the lobby-entrance space and an internal-stair located within a private apartment. A grand staircase in a public lobby is symbolic, a “Staircase of Honor,”2 used for ceremonial purposes. As in retail design, it serves as a prominent architectural feature, an icon that represents an apartment’s stylistic intentions. A Showcase Stair in the lobby may also convey the aspirations of the management or clientele in terms of class status. A grand stair defined the boundary between general public areas on the ground floor and private areas (for residents only) in upper levels. The oldest record of a grand staircase in apartments may prove to be the Eastern Apartments (1450-1370 B.C.E.) in the Palace of Minos at Knossos, Crete. The stair was located approximately at the middle of the east side of the Central Court and led to the state rooms. A light-well immediately adjoined the stair amplifying its spaciousness and grandeur.3 The walls were decorated with painted murals that included bands of running spirals—superimposed with full-sized replicas of the characteristic Minoan figure eight shields, in the case of the upper hall. The Grand Staircase at Knossos contained many of the elements that remain today—a sense of grandeur in terms of materials and finishes, decorative treatments and ornament, size and scale. Grand staircases from this time forward have also been lit by natural lighting. In the early 18th century, a grand stair became the first impression of the luxury French apartment. In 1702 Pierre Bullet designed a stair as a staged experience.5 The grand staircase had two large stair “stages” from the entrance on the ground floor that led to the great antechamber which preceded the salon upstairs. At the first stage, the straight stair is full of light and has stunning views from French windows that open onto the garden. Then the large opening of the stairs narrows between two decorative columns. It opens again to a grand opening, and terminates with elegant curvilinear stairs with fashionable rounded corners. Early luxury New York apartments, such as Richard Morris Hunt’s Stuyvesant Apartments on East 18th Street, interpreted the French apartment style of grand stairs. In an described the tenant’s stages of entry as arriving first in a “sparely decorated lobby and from the lobby they went to the grand stairway and reached their own front doors from either end of a public landing.”6 The stairway opened into the private hall of each unit. The stairway toward the front of the building rose around a circular open well in the center (often filled with natural light), while the service stairway in the rear was a tight spiral. The grand stair in the Stuyvesant Apartments is not much as magnificent and elegant as French apartments, but reminiscent of typical features of Parisian grand stair design. With the installation of electric elevators in the 1880s, luxury apartment buildings expanded in number of stories, and grand staircases tended to be subordinated functionally. They continued, however, to appear in public lobbies, but connected only the first floor to the second floor. Nonetheless, the grand stair continued to be regarded as a status symbol. For a while elevators and grand stairs coexisted in elegant lobbies. For example, in 1909 Harde and Short’s design for a New York apartment at 44 West 77th Street, consisted of a Gothic-style groin vaulted lobby, with stone foyers and passenger elevators.8 By the end of the 20th century, apartment skyscrapers replaced those less than fifteen stories, and the grand stair disappeared from the lobby, replaced with a passenger elevator. The 1936 Le Courbusier spiral stair for a Paris apartment, Ward Bennett’s 1979 spiral for an apartment in the Dakota, New York City, and Michael Gabellini’s 1989 interpretation, also in New York City, can be read as a sequence of design reiterations, each stair becoming more sculptural and abstract through time. From the 1990s forward the dematerialization of the spiral stair influenced the design other stair types in efforts to make them appear free floating or suspended in space. Showcase stairs have taken on countless lightweight shapes, refined details, and transparent materials. Functionally and aesthetically, these contemporary showcase stairs allow limited square-footage apartment interiors to save space, to allow natural light to penetrate deeper into spaces, and to create dynamic spatial effects. An open plan for apartments encouraged the design of ethereal showcase stairs in the center of a space. The visual accessibility of stairs enhances the concept of openness through materiality and forms. For example, each stair tread is fixed parallel to the wall to the second floor without handrail, a single sheet of steel was folded together, or showcase stairs made of glass and steel plate is hung from the ceiling. Therefore, these contemporary showcase stairs achieve a high visibility and heighten both the awareness of one’s own presence and the experience inside the showcase stairs. 1) Leah Scolere, “Theory Studies: Contemporary Retail Design” (M.A. Thesis, Cornell University, 2004), 68. 2) Julien Guadet, Elements et Theorie de l’Architecture (Paris: Librarie de la Construction Moderne, 1905), n.p. 3) John Templer, The Staircase: History and Theories (Cambridge, Mass. : MIT Press, 1992), 94-95. 4) Templer, The Staircase, 122-128. 5) Peter Thornton, Authentic Décor: The Domestic Interior, 1620-1920 (New York: Viking, 1984), 94-95. 6) “Houses on the European Plan,” (Nov. 6, 1869): 3 in Elizabeth Collins Cromley, Alone Together: A History of New York's Early Apartments (Ithaca, N.Y.: Cornell University Press, 1990), 88. 7) Stephen Calloway, Twentieth-Century Decoration (New York: Rizzoli, 1988), 48-49; Staircase, Casa Batllo Apartment  Antonio Gaudi; Barcelona in Stephen Calloway, Twentieth-Century Decoration, 48-49. 8) Andrew Alpern, New York’s Luxury Apartments: With Original Floor Plans from the Dakota, River House, Olympic Tower and Other Great Buildings (New York: Dover, 1975), 60-61. 9) Werner Blaser, Mies van der Rohe--Lake Shore Drive Apartments: High-Rise Building (Basel: Birkha¨user, 1999), 11, 14-15. 10) Templer, The Staircase, 1-11, 95, 119-120. A piano nobile is the principal floor of a large house, usually built in one of the styles of classical Renaissance architecture. This floor contains the principal reception and bedrooms of the house. The piano nobile is often the first or sometimes the second floor, located above a ground floor containing minor rooms and service rooms. The upper floors had better views and avoided the damp ground plane. 11) Alpern, Luxury Apartment Houses of Manhattan, 124-129. 12) Alpern, New York’s Luxury Apartments, 116-117. 13) Eva Jiricna, Staircases (London: Calmann & King Ltd, 2001), 13. 14) Calloway, Twentieth-Century Decoration, 268. 15) Templer, The Staircase, 60; Living Room  Le Corbusier; Paris in "Fantasy on the Roof of Paris," Architectural Review (April 1936): 155. 16) Michael Spens, Staircases (London: Academy Editions, 1995), 10. 17) Living Room, Dakota Apartment  Ward Bennett, New York in “Soothing, Serene, Civilized,” Interior Design (Sep.1979): 246. 18) Matteo Vercelloni and Silvio San pietro, Urban Interiors in New York (Milano: Edizioni L’Archivolto, 1996), 52-61. 19) Silvio San Pietro and Paola Gallo, Stairs: Scale (Milano: Edizioni L’Archivolto, 2002), 96-99; Bedroom  Michael Gabellini, New York in Oscar Riera Ojeda, "Dente Residence," The New American Apartment (New York: Whitney Library of Design, 1997), 232. 20) San Pietro and Gallo, Stairs: Scale, 202-203; Living room  Guilaume Saalburg, Milan, Italy in Eva Jiricna, Staircases, 202-203. 22) Scolere, “Theory Studies: Contemporary Retail Design,” 69; Living Room  Guilaume Saalburg; Paris in Eva Jiricna, Staircases (London: Calmann & King Ltd, 2001), 66-9. 23) San Pietro and Gallo, Stairs: Scale, 106-109; Living room, 860 Lake Shore Apartment [unknown date] Krueck and Sexton, Chicago in “Kitchen Cabinet,” Interior Design 68, no.4 (Mar.1997): 77. 24) 1930 Paris Apartment  Le Courbusier; Paris, France in "Fantasy on the Roof of Paris," Architectural Review, no.473 (April 1936):155. 1970 Paris Apartment, Charles Boxenbaum; Paris, France in "Apartment by Charles Boxenbaum," Architectural Record (Jan. 1979): 109.; New York Apartment, Ward Bennett; New York City in “Sooting, Serene, Civilized,” Interior Design 50, no.9 (Sept.1979): 246.; 1980 New York Apartment  Michael Gabellini; New York City in Oscar Riera Ojeda, "Dente Residence," The New American Apartment (New York: Whitney Library of Design,1997), 232; Cooper Bauer Apartment  Denison/Luchini Architects; Boston, Mass. in Oscar Riera Ojeda, The New American Apartment, 88., 1990 Milan Apartment  Guilaume Saalburg; Milan, Italy in Eva Jiricna, Staircases (London: Calmann & King, 2001), 202-203; Chicago Apartment  Valerio Dewalt Train Associates; Chicago in Oscar Riera Ojeda, "Gardner Apartment", The New American Apartment, 56.; 860 Lake Shore Apartment, Krueck and Sexton, Chicago, in Edie Lee Cohen “Krueck & Sexton,” Interior Design 61, no.3 (Mar. 1997); 7; New York Apartment, Maya Lin Studio; New York Cityh in "Norton Apartment," Architectural Record (Sept. 1999): 134; 2000 New York Apartment, Graftworks; New York City in “Stair Masters,” Interior Design 72, no.14 (Nov. 2001): 92; Sydney Apartment  Engelenmoore; Sydney, Australia in Ana G. Canizares, New Apartments (New York: Collins Design, 200), 260; Rudolph Apartment, Jared Della Valle and Bernheimer in "Norton Apartment," New York 39, no.35 (Oct. 9, 2006): 54. 2) Kim, Najung.“Theory Studies: Archetypical Practices of Contemporary Luxury Apartment Design.” M.A. Thesis, Cornell University, 2009, 102-118.